I want to map out a trip across the Island - where do I start? Can I do this trip by myself? How long does it take to cross Newfoundland by ATV? Do you have to travel the entire Island or can you do just a portion of it? Why do some people travel from Port Aux Basques and back instead of going across the whole island? How long is the ferry from Nova Scotia to Newfoundland? Should I start the trip on the West (Port Aux Basques) or East (Argentia)? How much will it cost to take the Marine Atlantic Ferry? Where can I leave my car/truck and trailer? How much gas will our ATVs use? How much for motel/hotel rooms? How about the cost of food? Can you give me an approximate "total cost" for the entire trip? Can you ride an ATV directly on the ferry or do you have to haul it? What is the condition of the trail? I heard there is a GAP in the trail around Corner Brook. Is it difficult to get around? Can you drive your ATV right off the ferry to the trail in Argentia? Can you give me directions to the trail from the Argentia Terminal? Can you drive your ATV right off the ferry to the trail in Port Aux Basque? Q. I want to map out a trip across the Island - where do I start? Argentia to Clarenville, Clarenville to Gander, Gander to Badger, Badger to Deer Lake, Deer Lake to Robinson's, Robinson's to Port Aux Basques. The tracks shows how many miles we traveled each day, how long it took and where we stopped for fuel. You can download them and save them in your GPS to follow along when you arrive in Argentia. Also check out the Entire Trip Map in Google Maps. You can zoom in very close to the icons I placed on the map so see where we stopped for motels, gas, food, and camping. Optional - purchase "Trans Canada Trail" by Sue Lebrecht. This book is fantastic. It contains a detailed map broken into sections and has a lot of information for each section of the trail. I bought my copy online through Amazon.ca. Q. Can I do this trip by myself? A. Sure, but I wouldn't suggest it. It's more fun with other people. More importantly, if you have a mechanical breakdown or a medical emergency your life could depend on having another person with you. It could be a long time before someone found you if you needed help. Q. How long does it take to cross Newfoundland by ATV? A. From coast to coast it's approximately 900 km and 6 days of traveling depending on your route if you follow the rail bed only. You could take 7 days or more and drive over 1200 km if you take side trips. Check out my "What Route Should I Take" page to help you decide. You can take more days or less depending on how fast you ride and if you like camping. Q. Do you have to travel the entire Island or can you do just a portion of it? A. You can go for as long as you'd like; a few days, a week, 10 days or more - it's up to you. It's all in how you plan your trip. Q. Why do some people travel half way and back instead of going across the whole island? Port Aux Basques, Wreck House, Serpentine Lake, Georges Lake, Deer Lake, and the Gaff Topsail are all on the West/Central Regions. I feel those areas offer the nicest scenery. Once you pass Badger (heading East) you don't have as nice of scenery, in my opinion. The ferry from Nova Scotia to Port Aux Basques is 6-7 hours vs. 16 hours to Argentia, and it costs half as much. If you are on a budget, and don't want to be on a 16 hr ferry those would be important considerations. If you do the whole island I suggest East to West as the scenery continually gets better and better and you take the short ferry home after a long trip, which is nice. Q. What is the best way to get there? A. If you're taking an ATV with you there is only one way - the Marine Atlantic ferry. They have a few ferries making the journey. One heads to the West Coast and the other to the East Coast. They both leave from North Sydney, Nova Scotia. Q. How long is the ferry from Nova Scotia to Newfoundland? A. North Sydney to Argentia (east coast) 15-16 hours. North Sydney to Port Aux Basques (west coast) 6-8 hours. I suggest getting a room, otherwise known as a berth, for each trip, especially the 15 hour one. You'll thank me! Q. Should I start the trip on the West (Port Aux Basques) or East (Argentia)? A. You can start your trip on either side and return from the opposite. Keep in mind the ferry to Argentia is 15 hours - most start there to ensure the shorter ferry back at the end of the trip. Plus I feel the nicest scenery is on the West coast so it's nice to end the trip seeing the best the Island has to offer. Q. How much will it cost to take the Marine Atlantic Ferry? A. Complete Ferry schedule and pricing can be found on Marine Atlantic's website www.marine-atlantic.ca. Quick break down below: (prices as of March 2017). $512.40 Grand Total - for both ferry rides and with two people to a room, assuming you get a room both ways, YOU SHOULD! Q. Where can I leave my car/truck and trailer? A. A&L Parking (902-561-0011) across the street from the ferry terminal. CASH ONLY. Pricing as of April 2016. $15 for the first day and $7.50 each day after that. Would be $67.50 for 8 days. $10 for the first day and $5.00 everyday after that. CASH ONLY. There is almost always room, just show up. If no one is there just leave your cash in an envelope in the booth drop box. Cash only! A. I took a Polaris Sportsman 500 loaded with camping gear. Q. How much for motel/hotel rooms? A. In 2013 we stayed at motels every night. It cost each of us $365.38 total for the week. We had two occupants per room each night. If you spend some or all of your nights camping you will obviously spend less. Q. How about the cost of food? A. I paid $226.91 for food in 2013, that was all restaurant meals. What you spend on food depends on your taste and budget. You can spend a lot if you eat at restaurants every day. It's relatively easy to find groceries and supplies if you want to cook for yourself. It's also a lot of fun to cook on the trail. Q. Can you give me an approximate "total cost" for the entire trip? A. In 2013 I spent $1,400.00 total - that included ferry tickets, food, gas, liquor, hotels, parking, etc..Keep in mind we stayed at Motels each night and food costs were higher because we at restaurants every breakfast and supper. Other years I did it for around $1,000.00 by camping two nights and and cooking some meals on the trail. Q. Can you ride an ATV directly on the ferry or do you have to haul it? A. You can simply drive it on the ferry and leave your truck and trailer at A&L Parking which is across the street from the Ferry Terminal in NS. A&L parking (902-561-0011). They only take cash. Parking prices are listed above under Budget. Q. What is the condition of the trail? A. Most of the trail is in good condition and is an easy ride for ATV or side by sides, even for most beginners. There are long sections with water ruts or 'whoops' which could get tiring if you have an older machine. In fact I don't recommend this trip without a newer machine with a good suspension system. There are also sections of trail lined with tall alder bushes that make it difficult to see around corners and that could be a bit dangerous so be sure to slow down on corners. Anyone with any experience won't have any issues - unless you are taking a trailer for extra gear. I don't suggest a trailer as it would slow you down especially in sections with whoops. Having said that, I know people that have taken trailers. Just make sure they are tough as nails and can handle the abuse of the whoops. Most trailers I've heard of break on this trip. In 2015 I heard of a guy that brought a trailer and it popped off the hitch ball and when he stopped the trailer came forward and broke his rear differential. His trip was over. NOT GOOD. Q. I heard there is a GAP in the trail around Corner Brook. Is it difficult to get around? A. One section is missing between Corner Brook and Pasadena. The most popular way around the gap is to hire a flat-deck tow truck to haul you and your ATV's to the next part of the trail. It'll cost you about $40 per person. I've heard some people ride the highway but that is dangerous and illegal. Call Cecil Anderson (709) 686-5534. The Anderson's can take four ATV's or three ATV's and a side by side. Cecil has a pickup truck with a flat bed style trailer. He is very knowledgeable about the trail and helped me out of a jam with a single phone call. He's a very gracious fellow and also offers week long tours and day-tours at Newfoundland Outdoor Adventures. Conway’s Towing Service (709)634-2338. Call Conway's if you have more than four ATVs. They have multiple flat bed tow trucks that can fit a about a dozen or more ATV's. Q. Can you drive your ATV directly from the ferry to the trail in Argentia? A. Yes, it's only 2.5 km (1.5 miles) from the Argentia Terminal. Technically you are not supposed to drive an off road vehicle on the highway in Newfoundland but for these short distances you won't have a problem. I just drive in the center of the lane with traffic. ATV's are usually the first off the boat. Directions:Drive straight down the highway when you get off the ferry and in only 400 metres (yards), you will see a road on your left, Charter Road (it comes up fast). Take Charter Road and take it for another 2 kilometres (1.5 miles). It runs parallel to the highway. If you miss Charter Road keep going down the highway, you can turn left in another 2 km at the trail. Charter Road is shown below splitting left off the highway. Next, keep an eye out for the small white building on your left. Look for the trail about 100 feet after the building. Here is an aerial view (from Google Maps) below. 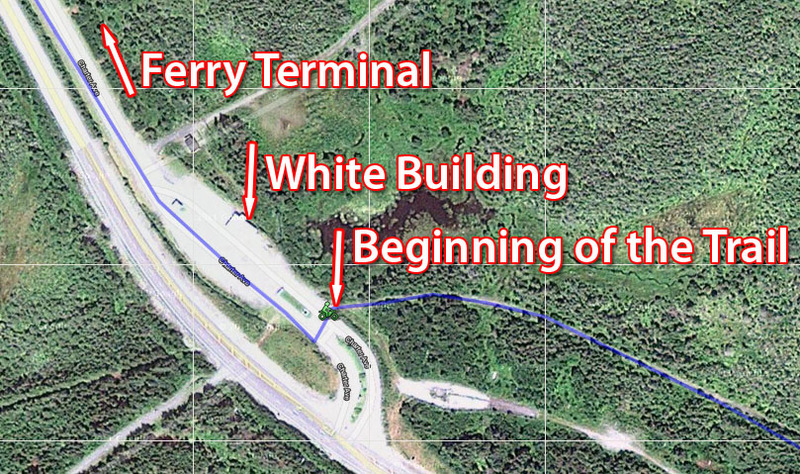 The section of trail you pick up after getting off the ferry isn't considered the T'Railway. It is an auxiliary trail that meets up with the main trail in Placentia Junction - which is approximately a 30 km ride (18 miles). It's an easy ride but can be slow going. ***Don't miss the sign in the picture below when you get to Placentia Junction and take a left!! ***Turn left or you will keep heading East to St. John's! Simply reset your trip meter on your ATV at the ferry or mark your mileage. When you hit the 30 km mark keep an eye out for this sign. It's easy enough to miss if you're not looking for it. Q. Can you drive your ATV directly off the ferry to the trail in Port Aux Basque? A. Yes you can. 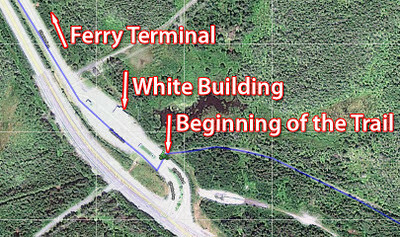 The trail is only 1.5 kilometres (or 1 mile) from the terminal. You can ride your ATV directly off the boat and go straight ahead until you see an Irving Gas Station on your left (below). Shortly after the station you will see a break in the road. Turn left over to the gas station side of the highway and head for the Orange Train. (shown in the far right of the image below) That is where the trail starts. BE MINDFUL OF TRAFFIC, it can be a busy stretch of highway. Click on the image to make it larger. Below is a map of the entire trail. It's a fantastic reference. Bookmark it in your browser on your smart phone when you go to NL so you can use it there. Click on the link above it to open a separate large window. If you zoom in close you can see where you can pick up the trail. Switch to Sat view when zoomed in and you can actually see the trail! I also included places we stayed, ate, found gas etc. I didn't see it here, but did you carry gas? Is there adequate opportunity to buy gas and fill jerry cans? I always bring extra gas with me just in case. I rarely ever need it but 5 liters should probably do it. There are gas stations along the trail. I have several of them marked on my map on the bottom of this page above the comments. If you have a machine with a big engine like an 800 or side by side you will probably want to bring about 10 liters of gas. awesome info and site 4 of us are leaving from digby county june 19th 2015...we are camping most of trip but might hotel/motel a couple nights to shower and sleep good or if rain recommend any good places to stay ? I hope you have a great trip! I'd stop in Badger at Trailblazer's. It has a BBQ, washer and dryer, and is next to a grocery store, pub, restaurant and gas station. Frosty's is a good place to stay in Gander, St. Jude's Motel is a good spot in Clarenville, Driftwood Inn in Deer Lake, and Pirate's Haven in Robinson's. Check out my 2013 photos page. There is information listed at the first of each day you may want to check out. The times on your trips, were you making frequent stops? What speeds were you averaging? Im planning to go from whitbourne to gander in one day out and the next day back. Hi Danny. Whitbourne to Gander is about 270 kms each way. I average about 140 a day but that is with several stops for pictures and chit chat, snacks, coffee etc averaging about 40 km/h while riding. You can drive faster than that easily in many places and if you limit your stops you can do it in less time than I do for sure. If you have any more questions feel free to email me. My address is listed at the top of the page. I see that most of the time you went with a group of 4, but in 2011 you had 6 people and you said that you may have 5 or more this year. Is there a preference? I know that a smaller group would be easier to feed when you camp and would create less dust on the trail. I'm just curious as in trying to plan a trip for next year. One year I went and there was 14 of us I think. Too big. I would suggest 4-6 as a good size group as it's easy to manage and keep everyone together. I've also gone with just two people and it was fun but I think 4 is the magic number. Don't let that stop you from bringing more than that however. Get out there, have fun and let me know how you made out! Would it be possible not to be trailered by going up to the sinkhole then taking the trail from Lomond to Corner Brook passing through Corner Brook and taking the trail from the highway back to the railbed. I thinks so. I traced out a few new trails a short while ago that shows you how you can get around Corner Brook without being trucked. The trail from Lomond is in yellow and the trail through CB is in red. I'm going to try it this year. A person I know that is familiar with the trail told me that would work. It means driving on the shoulder of the highway for a bit but if you drive responsible you should be fine. I'm sorry no I don't. You can always save the Web file from your browser so he can look at it offline. Is it possible to combine this trip with a visit to Gros Morne National Park? I know you can't take ATVs in the park but can rent a car in Deer Lake and drive there. Do you know if anyone has done that? Sure it's possible. You can definitely rent a car in Deer Lake and drive from there to Gros Morne. I love that park. I haven't done it but I've thought about it a few times. It would be easy enough to do really.